This is my first "write-up" on GeekHack, so please be kind. Recently there was a conversation in dorkvader's IBM bolt mod photo essay thread about using different materials other than super floss to dampen the pinging sound in the buckling springs. A few folks (myself included) postulated that something stiffer but still flexible, such as rubber bands, might do the trick. So I ordered a few different materials to do a comparison on my recently bolt-modded SSK. This thread will document the results. I tried three different materials in place of floss: paracord string, #18 nylon beading cord, and latex-free (silicone) loom bracelet bands. The paracord string is just the nylon core string pulled out from inside the outer weave. There are five or six core strings inside paracord, so a small length of cord will actually produce a good length of core string. This string can be tricky to cut. You need very sharp scissors to avoid fraying, and fraying is bad because it makes it hard to insert the string into the center of the spring. AFAIK, paracord string is the most popular alternative to floss. From what I've read, the recommended way to do this is to cut the string just shy of the length of the spring, so that it drops in and is a little bit recessed. The nylon beading cord is used by hobbyists to make bead necklaces and similar crafts. It comes in small spools and is pretty cheap (here's the one I bought). This stuff was much easier to cut, even with cheap office scissors that have seen better days. But I figured it would be, since it's intended for threading, unlike the paracord material. As with the paracord, I cut this string just shy of the length of the spring. Finally, the rubber bands (well, silicone). I went with latex-free because some folks in dorkvader's thread suggested that natural rubber would degrade over time. I'm honestly not sure how much oxidation these things would be subject to, tucked away inside those little barrels. But just imagining having to fish out broken pieces of rubber band from 87 little springs was enough to drive me to seek an alternative. Fortunately, latex is a common skin allergy, and bracelets touch skin, so it's very easy to find bracelet bands that are latex-free. Here's what I ended up buying (note: these actually came in a big package with only pink, purple, and blue). Regarding length, I cut these tiny little bands into quarters, with each quarter being about 1cm or so. Because they were part of a small band, they retain a natural curve, but it's not strong enough to affect the buckling of the spring. For the sound test, I used my Audio Technica ATR2500 USB condenser microphone, which I mainly use for screencasting voiceover work. I don't know if it's the best mic for this task, but it's the best one I have. And I was very happy with the recording quality. First, I struck each key in sequence, three times in a row (Z,Z,Z,X,X,X,C,C,C,V,V,V) with the force that felt natural for testing. Next, I struck the same sequence with harder force, which felt more like the force I would use while actually typing quickly. Finally, I repeated the sequence with the same force as the first time, just because. I want readers to give me their honest evaluation here, but personally I think the rubber bands provide a deeper sound than the others, like a THUNK. And it's really hard to tell if it's placebo or what (this was my idea so I might be biased), but I think the rubber band does remove some of the ping without "deadening" the sound very much. Keep in mind, I'm also using a replacement Unicomp latex blanket instead of the original 2-layer IBM blanket. The Unicomps are said to provide more crispness, so maybe it's the two in tandem. You can certainly hear how crisp the unmodded Z key sounds. But you can also hear a whole lot of ping. So I went ahead and rubber-band-modded my whole SSK so that I could get a "real world" sound test. There's not much to this mod, really. The rubber bands are pretty much the perfect size for these springs. They slide in pretty easily. The curvier pieces require a little more guidance to get down in there. Note: the above picture shows the rubber bands after being pushed in by hand. I tested them like this and found that a few keys sounded "mushy" like this. But after taking a straightend-out paper clip and pushing the rubber bands down all the way to the bottom of the springs, the mushiness mostly went away. A few keys still sounded mushy after pushing them down. Upon closer inspection, these "extra mushy" keys all had slightly longer rubber bands in them. To fix this, I removed the cap, grabbed the spring with my fingernails, pulled up, and released, causing the spring to snap downward and the longer rubber band to pop out halfway. Then I removed and trimmed the bands shorter and re-inserted them. The mushiness went away in every case. Interestingly, the shorter rubber bands do not seem to come out with the "snap" method mentioned above, which begs the question of how to remove the rubber bands if you end up not liking them. I don't have an answer for this yet, so it's a good thing I'm happy with them so far. This is not apples-to-apples, but it's the best I could do. I recorded myself typing a paragraph on two different Model M's: the bolt-modded/blanket-modded/rubber-band-modded SSK, and my totally un-modded full-size Model M (which happens to have almost all rivets intact). If I had another bolt-modded board without the rubber bands, I would have recorded that. Or maybe I should have recorded this one before I performed the mod. Whatever. At the end of the day, it's not about how it sounds compared to other boards, it's simply about how it sounds. The SSK, although a smaller board, definitely has a deeper sound overall. 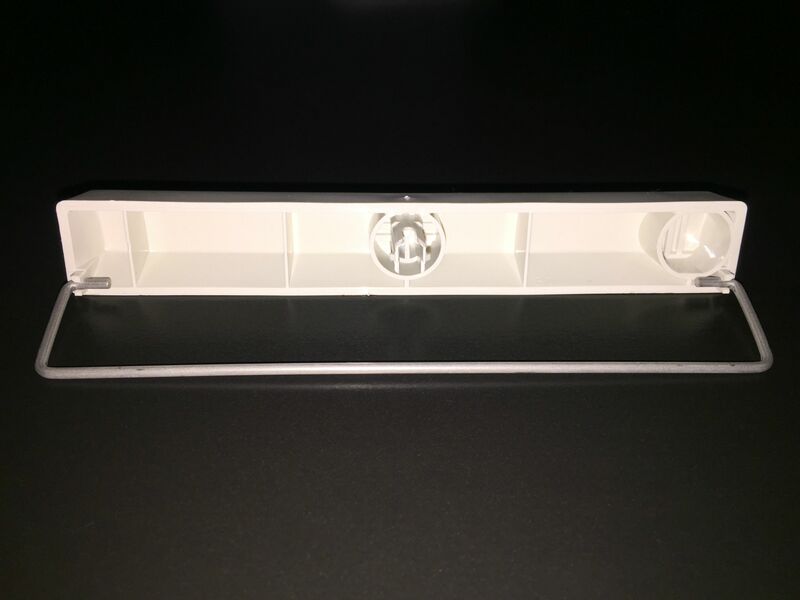 The spacebar is still a Model M spacebar, no amount of material in the spring is going to change that. But overall, I am happy with the crispness of the modded board, and the pinging is no longer a major component of the sound. I would love to know what you all think of this mod! Did I leave out any details? Please let me know. Interesting, anyways GJ on the Mod . Might be useful if you need your Model M loudness to be a little quieter. Wow, that bend really does cut down on the rattling. It's still a very loud key (it's big after all), but not nearly as rattly. Thanks for the tip!!! No problem! Bending the spacebar stabilizer is especially useful on Model F's because they have thinner stabilizers that can be extra rattly. Huh. The way I usually solve rattle is with a little grease. I don't add much, but it helps a lot. Thanks! I tried to be somewhat empirical about this, partly because I knew GH would appreciate that, but mostly because I didn't want to end up with a crappy sounding board. Next up I'm going to bolt-mod my full-size Model M. I got a new Unicomp blanket for that one, too. Once that's ready I might try the whole board with bead string, which according to my tests sounded a little nicer (to me) than the paracord. Then I'll perform a new sound test with the two fully-modded boards against each other. Why would anyone want to reduce the beautiful, loud resonance of the Model M? Blasphemy. I suppose it comes down to preference, but there is just something about that ping that a lot of folks don't appreciate. That said, the current floss mod seems to "deaden" the sound of the board, which is why I was looking for something different that would eliminate the high-frequency ping without affecting the crispness of the keystrokes. Agreed. I love my IBMs pingy as ****. Machine gun funk. Doesn't mean this isn't a cool mod though . To be clear, this is not a "silencer" mod like the o-rings on a Topre board. This is more of a "tuning" mod, adjusting the loud Model M sound to suit one's preference. If I had to pick one word to describe the sound of a Model M with this mod, I would choose "tight." Hey man I really was impressed with the sound difference here ! I'm a little worried about not being able to remove the band after but maybe you or me or someone will find a work around. I get my SSK back for max pretty soon here and I might experiment with this! Thanks for the great write up man very impressed ! Thanks for the kind words. It's probably good that you're still waiting on your SSK, it gives me time to use my modded board and make sure I haven't made a huge mistake. Although, after about 2 long days of intense coding using only my SSK, I'm happier than ever with the results. Especially since I put that little bend in the spacebar stabilizer, as suggested by gr1618 earlier in this thread. The board kind of feels and sounds like MX greens that went through puberty. I really would like to know what others think of this, so much so that I'm thinking about finding someone who is going to Keycon and sending it with them for others to try. Hey all, just checking in, as it's been about three weeks since I performed this mod. I just want to throw out there that I still really like the way this board feels & sounds. Over the past few weeks I have swapped between some Alps, MX Blues, Topre (well, Noppoo capacitive spring), and this rubber-band-modded SSK. I really do think this is one of my favorites now. I am planning to perform the same mod on my full-size Model M in the coming weeks. But I'm going to wait until after I screw-mod it, at which point I want to do some side-by-side testing with both boards. Because I performed this mod on my SSK very shortly after screw-modding it, I'm not sure how much of the sound & feel is a result of each modification. With KeyCon coming up, I'm wondering if any attendees would be interested in trying out this board? I'm not able to go to KeyCon but I can probably make arrangements to get this board there for a field trip. Oh man, such an interesting mod! Since it's been a while, have you done the mod on your model M yet? I'm very curious about that. Submit your images for inclusion in The Keyboard Coffee Table Book! Nope, sorry. I actually borrowed some keycaps from my 1391401 to ANSI-mod a Unicomp 122-key. So I'm not in a hurry to screw mod the IBM until I get some new replacement caps for the Unicomp. But the SSK is still kicking and I'm still really happy with the results of this mod.